The Velo’v public bicycle system in Lyon, France. 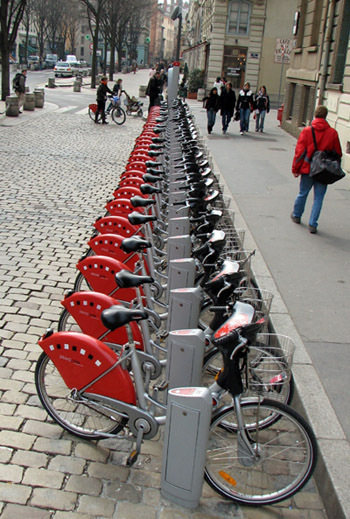 By the end of 2007 the city of Paris will have 1,450 bike stations offering 20,000 bicycles. bicycle stations scattered throughout the city, an ambitious program to cut traffic, reduce pollution, improve parking and enhance the city’s image as a greener, quieter, more relaxed place. atmosphere, a better way of life." the bikes were always the fastest." typically last just a few minutes. Ca sonne gran. Alors j’ai besoin de trouver un apartment. Too good to be implemented in India. people need to be radically civilized to use cycles and leave it in the stands. Here it will decorate the homes. A great initiative by our Mayor!!! Bound to be abused by some but I’m certain they have thought of that! .. call me an idealist, but I do love this idea.. it would be far better if the bikes were free to use and they were never stolen or thrown into the River Seine .. but then I am an idealist.